In a medium saucepan, bring 1 quart of salted water to a boil. Set up a bowl with ice water and place near the sink. Place asparagus in boiling water for 2-3 minutes until barely limp. Immediately transfer asparagus to ice bath for 5 minutes to stop the cooking process. Meanwhile, in a small saute pan over medium-high heat, add EVOO, mushrooms, and garlic. Cook about 2 minutes until mushrooms begin to brown. Add tarragon, salt, pepper, and a splash of balsamic vinegar. Set aside. Arrange sliced tomatoes and a handful of arugula on each salad plate. 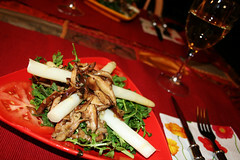 Top with asparagus spears and drizzle with shitake dressing.